then you need to get yourself to East Sussex sometime before September 11th. 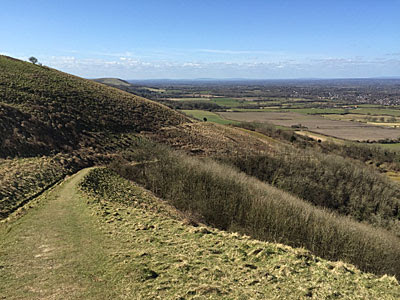 To Ditchling, a small village at the foot of the South Downs that hits well above its creative weight. 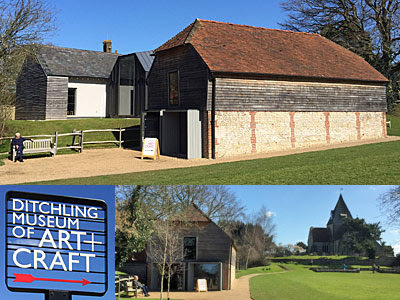 And specifically to the Ditchling Museum of Art + Craft, a repository of beautifully-made things designed by residents who were expert in their field. Ditchling's time as creative nirvana began in 1907 when sculptor and calligrapher Eric Gill moved in. Along with friends he founded The Guild of St Joseph and St Dominic, an experimental art colony mixing craft, Catholicism and community, whose members practised engraving, carving, weaving, metalwork and other Arts and Crafts skills. It's their work that fills the majority of this small museum. But this year another resident is getting the nod, namely Gill's calligraphy teacher Edward Johnston, best known as the man who invented the London Underground font. 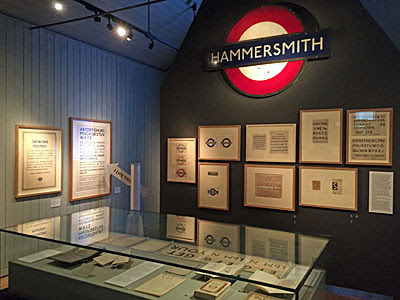 A compact but comprehensive exhibition space celebrates 100 years of Edward Johnston's lettering for London. The exquisite font that all of us in the capital take for granted was commissioned by Frank Pick, commercial manager of the London Underground Railway, and originally conceived as a joint project between Gill and Johnston. But Gill was called away to create stone reliefs for Westminster Cathedral, leaving Johnston to finalise his masterpiece alone. Their initial inspiration had been the simplicity of Roman lettering, in particular in the creation of a typeface at odds to the flowery serif fonts of the day. Various drafts of the alphabet are on show, with scribbled notes in the margins (as much as any top notch calligrapher ever scribbles). Here are the pencil lines that helped to guide the ascenders, and curves drawn with graph paper precision to aid perfect reproduction. The font needed to be available in light, medium and bold weights - no easy task before the dawn of computer aided design, Subtle nuances evolved daily, tested out on the village printing press, until the 'Block Letter Alphabet' was handed over to Pick in 1916. Initially used only for posters, it wasn't long before it was rolled out across the whole system, including the Hammersmith roundel that looks down over this special collection. For a complete history, the exhibition includes several examples of Johnston's nigh-flawless calligraphy - in books, in letters, and as examples for his private pupils in the village to copy. A portrait shows him with a 'jaded Monday evening look', the pursuit of perfection never easy to bear. Here too are some of the drafts of Eric's famous font Gill Sans, shamelessly inspired by Johnston's Underground typeface, since used by Penguin books, LNER and the BBC, amongst others. And there's a look at Eiichi Kono's upgrade of the font to New Johnston in 1979, the version that adorns our maps and platforms today. 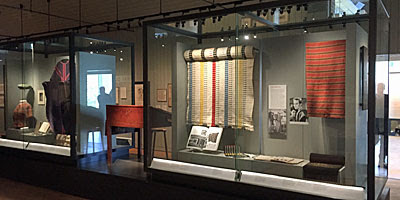 Elsewhere in the main gallery the craftsmanship of Ditchling's other artists is celebrated, and occasionally craftswomanship, as with the weaver who designed the curtains for the Royal Festival Hall. Eric Gill's work is appropriately showcased, along with lesser known but equally skilful engravers, designers and silversmiths. A separate room contains the village letterpress plus all the ingredients needed to assemble a printed page, along with some of the everyday posters churned out thereof. Continuing the typography theme are a set of railway, inn and other village signs, plus an intriguing selection of painted slogans by Bob and Roberta Smith in the introductory room. He cites the District line as his greatest inspiration, and thanks Johnston for opening his eyes to the possibilities of artistic expression. The museum spans several linked buildings, old and new, including a large room at the rear where children's events and adult workshops can take place. A small but well-stocked reading room allows you to kick back and read around the guild members and their creative skills. And don't forget to look up at the timbered roof space in the entrance building, originally a farmyard Cart Lodge, rather than simply picking through the gift shop or sitting down with a frothy coffee. Everything about the DMAC is proportioned, pristine and professional, which helps explain why the building and the presentation of its collection has been shortlisted for so many awards since reopening in its current form in 2013. If you can wait until 30th April, the Village of Type programme will spread its wings further across Ditchling. Expect to find a typographer in residence, a letterpress showcase and the appearance of various spraypainted letters on several walls and buildings around the village. Further afield a tube carriage will be turning up at the Brighton Festival, a printing press trolley will be pushed up the gangways of Southern trains from Victoria, and a steamroller will tour various locations including the next London Transport Museum Open Day. To get to Ditchling, take the Brighton train and alight at Hassocks, from where it's a half hour walk due east along the main road. The museum's basic entrance fee is £6.50, minus whatever for concessions plus whatever for Gift Aid. Don't come on Sundays or Mondays because it's closed, with the exception of Bank Holiday Mondays, which is good news this Easter. I spent an hour inside, partly by walking round twice, but definitely considered I'd had value for money.